Adult Komodo Dragon on Rinca Island. Everyone has heard of the mighty Komodo Dragon, yet relatively very few people make the long trip to see them in eastern Indonesia. Komodo island is about four hours by boat from Labuan Bajo on Flores; it is possible to visit on a day trip, but many opt for a two day, one night cruise for a more relaxed experience. In Labuan Bajo, we spent a few hours shopping around the travel agencies and eventually settled on Komodo Expedition, who weren’t the cheapest operator in town but we were swayed by their professional attitude and glowing online reviews. Our fairly large, comfortable boat came fully equipped with three crew (the driver, his assistant, and a cook), and a choice of two cosy cabins. Hiring the boat as a private charter including all meals (lunch and dinner on day one, breakfast and lunch on day two), came to about $220. A bit of a splurge for the average backpacker budget, but in terms of value it was unbeatable. The food was plentiful and excellent, and included freshly caught fish for lunch on the second day. We set sail at 8am, heading south-west towards Rinca island. The two-hour voyage revealed few birds of note apart from a small mixed group of Greater Crested and Lesser Crested Terns near Labuan Bajo, several Black-naped Terns at their nesting islets, and an occasional Brahminy Kite or White-bellied Sea Eagle passing over. Docking at Rinca island, we walked the short distance to the park headquarters. Straight away, it was noticeable how arid the island was, with open sunbaked mud, savanna-type dry forest, and no natural fresh water to be seen. We later learned that the few sources of fresh water on the island are a magnet for the local animals and therefore a favorite hunting ground for Komodo Dragons. We opted for one of the “medium” length treks, in the company of a compulsory guide. Permits for Komodo National Park totaled 600,000 rupiah (= $46 or £30) for one day for two people, including entry fee, government taxes, guide fees for Rinca and Komodo, and snorkeling permits. It’s quite expensive by Indonesian standards – one hopes that the money is being efficiently used to protect the park and its wildlife. Something we noticed straight away was the abundance and fearlessness of large mammals. Deer are everywhere, even close to the park buildings, and macaques are common. The monkeys have been introduced to Rinca – this is one reason why small birds are scarce on the island, as the macaques eat their eggs. Komodo, which has no monkeys, is by far the better of the two islands for birding. 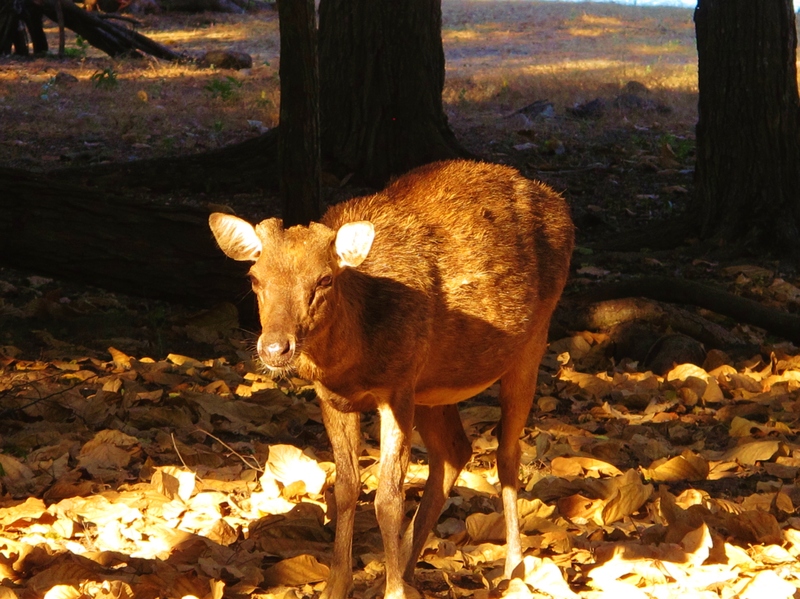 Komodo island deer …. dragon food! Rinca is currently the best bet for guaranteed dragon sightings. Behind the rangers’ kitchen, just a short distance from the park HQ, we quickly saw three of these great beasts, two of which were quite large and around 18 years of age. Our guide told us that they continue growing throughout their lives, and reach a maximum age of about 35 years; they have no natural predators and their demise usually comes when they lose their teeth and can no longer hunt. 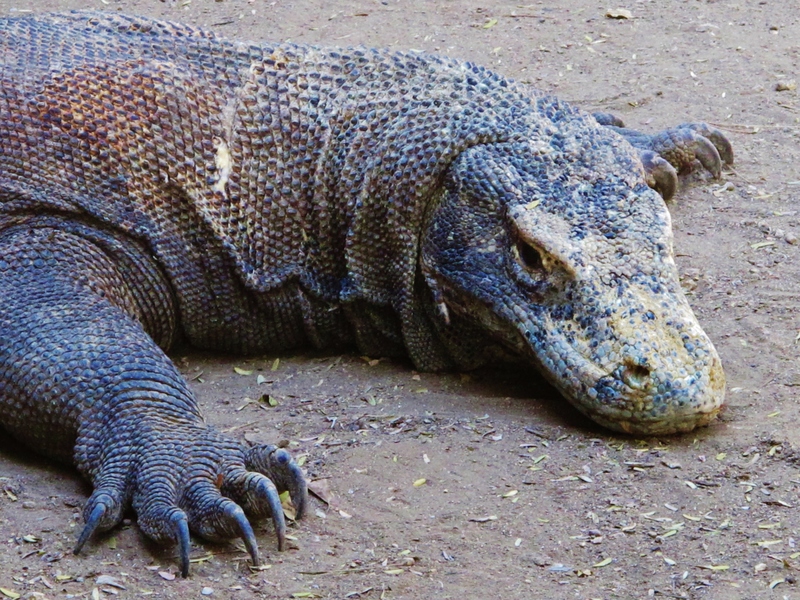 Komodo Dragons usually prey on deer, wild pigs, buffaloes and monkeys, and can also be dangerous to humans. They seem quite sedate most of the time, but are capable of sudden bursts of speed when an unwary animal strays too close. We were able to observe the resting dragons safely at a range of about 4 meters; any closer than this and we would have risked a bite, which can lead to serious infection and even death. In the wild, after having bitten an animal, the Komodo Dragon follows it around until the animal eventually dies of the poisonous bite. These predators have an extraordinarily powerful sense of smell, and other dragons from as far as 2km away quickly descend on a fresh kill. 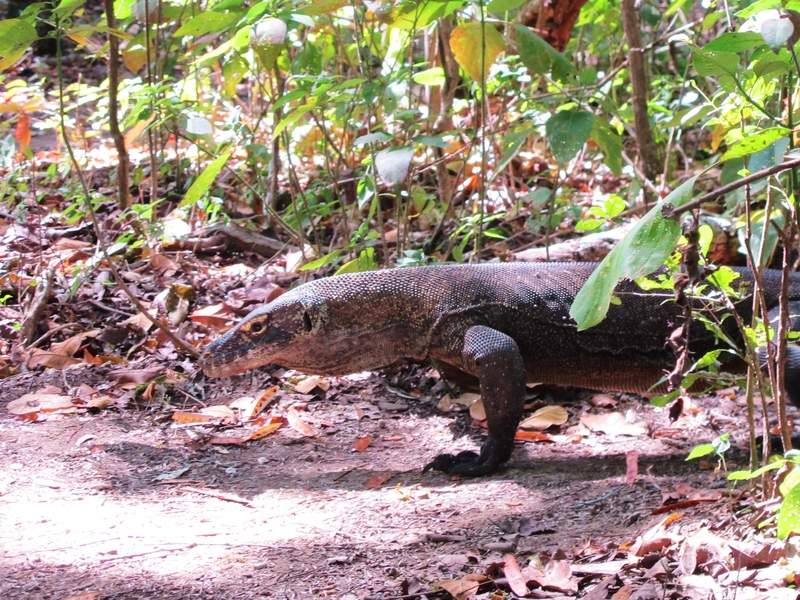 They only need to eat a couple of times a month – my feeling was that life is quite easy for a Komodo Dragon, as their prey species are so abundant on the islands. Apart from the dragons hanging out behind the kitchen, we had two more sightings of these fearsome reptiles during our hour-long trek: a big one lying right next to the path, and another slightly smaller one walking along a forest trail. Komodo Dragons are cannibalistic, so small ones less than about 4 years of age live exclusively in the trees in order to avoid the big dragons on the ground below. Birding on Rinca wasn’t very impressive, but this was probably partly due to being there in the heat of the day. Orange-footed Scrubfowl is supposedly quite common, but much easier in the early morning and we didn’t see one – our hike yielded only low numbers of very common species, such as Black-naped Monarch and Pied Bushchat. 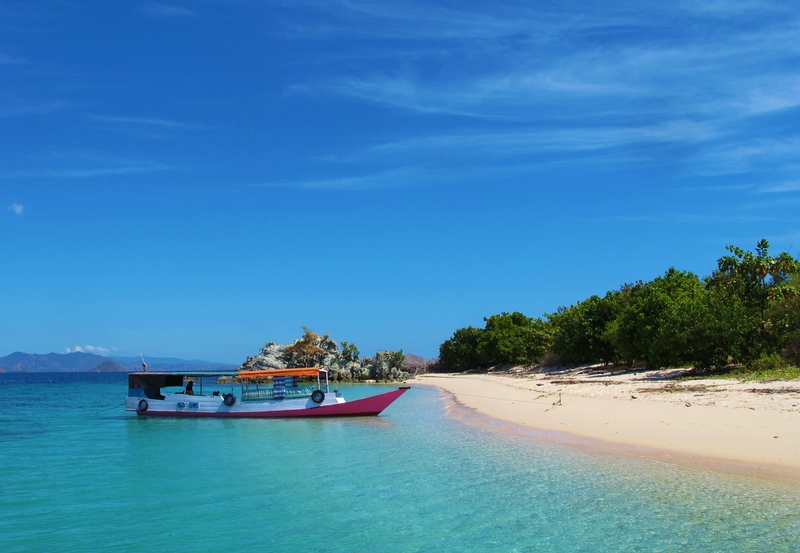 Bidadari Island, offshore from Labuan Bajo on Flores; Komodo national park has many similar small islands with clear water, white sand beaches, unspoiled coral and no one else around to share it with. At about lunchtime we set sail again for the two-hour boat ride to Komodo, seeing almost no birds along the way but enjoying the sunshine and splendidly rugged island scenery. Komodo island has a huge concrete pier, presumably to make it easier for large numbers of tourist boats to dock; but there was only one other boat docked there and we saw only two other tourists on the island. Local people sell handicrafts such as carved wooden dragons from a small warehouse on the island; they seemed desperate for our business and it was quite painful to have to turn them down, but we have no space for heavy souvenirs in our backpacks. We bought two fresh coconuts from one man, but he didn’t have a machete to cut them open for us, and nor did anyone else in the area it seemed, so this deal fell through much to the man’s disappointment (and ours, since we were thirsty). I don’t know how he expected us to drink the coconut water if we couldn’t get the coconuts open …. hopefully the vendor will come better prepared with a knife next time. Amid this almost ghostly lack of tourists, we recruited a guide to take us on an island walk. Komodo is very hot and very dry, and the guide was pessimistic about our chances of connecting with Yellow-crested Cockatoo at this time of day – but we lucked out with superb views of one in a tree right above the path. This was my main target bird on Komodo, it’s a critically endangered parrot that is now extinct in the wild almost everywhere else but maintains a final stronghold here. I was elated with this sighting, but couldn’t continue my lucky streak with Orange-footed Scrubfowl, which again eluded us. Green Junglefowls were, however, plentiful, and there were a handful of other birds to be seen despite the mid-afternoon heat including abundant Green Imperial Pigeons, White-shouldered Triller, Sunda Pygmy Woodpecker, Blue-tailed Bee-eater, an Asian Koel, and brief views of a flushed buttonquail that had to remain unidentified. Among the other animals, Wild Boar are noticeably abundant here, providing a key prey species for Komodo Dragons. However, we didn’t actually see a dragon on Komodo, much to the disappointment of our guide, although having already seen the dragons on Rinca I was more bothered about having missed Orange-footed Scrubfowl. A final excellent bird sighting on Komodo was a species I’ve been wanting to see for some time, in fact one of the few East Asian shorebirds I had been missing from my list – Beach Thick-Knee. Three of these magnificent birds flew past as we walked along the concrete pier. This is yet another bird that is declining in the region due to human pressures, because they depend on undisturbed beaches and mudflats for feeding. However, I imagine they must hopefully maintain a fairly healthy population among the uninhabited islets of Komodo National Park. After leaving Komodo pier, we headed south along the coast, spotting a soaring Lesser Frigatebird en route, and moored offshore of some mangroves for the night. Nearby, hundreds of enormous fruit bats appeared at dusk and flew over the boat; the sunset and full moon added to the eerie spectacle. Upon awakening to a fiery sunrise and freshly cooked banana fritters, I spotted several Yellow-crested Cockatoos perched distantly on tree tops on the island, but unfortunately we were a little far from the mangroves to have a chance at spotting any rails or crakes. We spent most of the second day visiting various snorkelling sites on our way back to Labuan Bajo. The coral here is almost pristine, especially near Komodo Island and off Kanawa Island, and aquatic highlights included a turtle, a huge Manta Ray, and a pod of dolphins, as well as thousands of tropical fish. While it was tempting to revisit Komodo Island for Orange-footed Scrubfowl, we decided against it as this would have involved paying another round of hefty entrance fees, and Jenna wasn’t too keen on the idea of another baking hot hike around the island. While on the subject of islands, I should mention a day trip we made from Labuan Bajo to an inshore island called Bidadari (or Angel Island). It offers pristine white sand and good coral and is just 30 minutes by boat from the town. It was the only place I saw Lemon-bellied White-eye, an Indonesian endemic that specialises in small islands – it was abundant on Bidadari but seemed entirely absent on the Flores mainland just a short distance away. Komodo National Park lifers: Yellow-crested Cockatoo, Beach Thick-Knee, White-shouldered Triller. A “small” Komodo Dragon emerging from the bushes on Rinca Island.